I read somewhere once that boxing experts are fond of saying that "styles make fights." Meaning, of course, that not every fight is entertaining to watch, because certain fighters don't complement one another, stylistically. This is something that manifests itself often in basketball: throw together two teams that are superior defensively — like, say, the San Antonio-Detroit NBA Finals in 2005 — and it's just not all that compelling to watch. That's just the way it is. Ultimately, I think this is why there is so much public outcry over an Alabama-LSU rematch: beyond the ongoing absurdity that is the BCS, it's just tough to sell a game like that to the general populace. It's basically the same two teams — two great defenses, hard-hitting, physical offenses that don't make many mistakes, two teams that basically grind away their opponent's will to resist them over the course of four quarters. When you put two teams that basically do the same things like Alabama and LSU, they constantly get in one another's way, the score drops like a rock and people who aren't diehard football fans — that means me, and (I hope) you — start changing the channel. Nothing can really help that. This doesn't absolve the BCS, an annually embarrassing system that we're all forced to live with, like a drunk cousin who crashes Christmas dinner every year and makes us feel uncomfortable (only nobody can tell him to leave because he's our lawyer or something). It's patently ridiculous that we all had to crowd around our television sets Sunday like we were waiting on election returns, waiting to see if we'd carried enough votes to have a national championship shot. I'm happy we're in, but being a part of this annual absurdity makes me feel like a shower. — I hate typing this because it makes me sound like I don't want to win the game, but the shame of this postseason is that it may take away from the 2011 LSU season, which may be the best season in SEC history. To reach this point, LSU beat Oregon (Pac-12 champs) at a neutral site, West Virginia (Big East champs) on the road, No. 2 Alabama on the road, then wrapped the season by whipping No. 3 Arkansas and SEC East champ Georgia (also a neutral site and a de facto road game). Other than Bama, the closest anyone came to beating them was Mississippi State (19-6). And they've done all this without one player on offense who would be considered terribly memorable — a bunch of very good players, yes, but no one horse like Trent Richardson or Justin Blackmon. Just a well-coached group of guys who take care of business every night. — The biggest wild card every year with this game (and one of the biggest parts of the absurdity): the 6-week layoff. Last year, Auburn and Oregon spent most of the night looking like 2 teams playing pickup flag football — it's a testament to both squads that they were able to pull it together by the 4th quarter. Combine the inevitable rust with the thousands of hours of defensive practice and you're almost guaranteed to see another game like the 9-6 bruiser in Tuscaloosa. Sorry, guys. 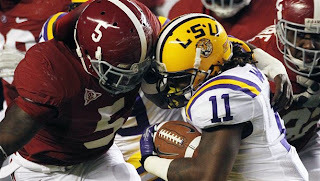 — One group that is definitely not upset about Alabama and LSU in the big game: New Orleans. In fact, they're probably already counting their cash, just to save time. — Nick Saban drew a lot of criticism — of course he did — for voting Oklahoma State fourth in his ballot for the USA Today poll. Interestingly, Deadspin criticized him yesterday ... for not being selfish enough. Push a little, and every aspect of conventional balloting logic begins to wobble a little. 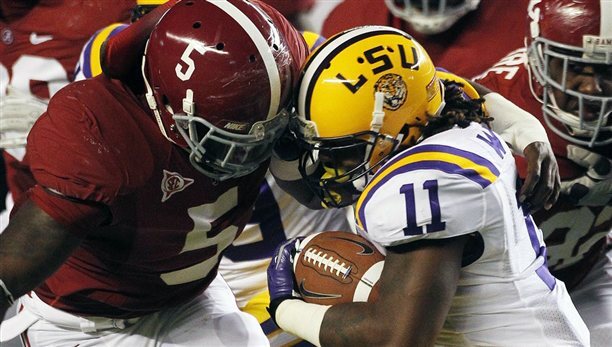 Let's go back to Saban: As you know, he ranked his team behind LSU. In other words, he stated that he believed LSU was the best team in the country and that Alabama was not—yet he maintains Alabama ought to have the opportunity to show they are better than LSU. If he thinks his team will beat LSU, then he must believe his team is better than LSU—but his ballot suggests otherwise. If a coach doesn't think his team will win, why are they even allowed to play? And what will Saban say if the Crimson Tide win the championship? "I guess we're better than I thought we were"? — As an aside, how angry must Boise be that they're not part of this mess? Boise's game plan every year is exactly the same: Win a couple big games early; dominate the conference; hope for chaos. So this year the Broncos handle the first part, get the 3rd part as a gift ... and get tripped up at home in conference play. Unbelievable. If ever there was a year for an undefeated Boise to get a shot, this would be it. But no dice. — Finally, since I spend so much time complaining about what I dislike about this whole thing, allow me to say something positive: This Alabama team has been, frankly, outstanding in 2011. Even if this year's schedule didn't turn out to be terribly imposing — the best win we claimed all year was vs. Arkansas, way back in September — this Crimson Tide team was a special kind of dominant all year, and deserves to be appreciated for it. Digging a little deeper, this level of success is one that hasn't been seen in Tuscaloosa since the 1970s: four straight seasons with double-digit wins, consistent ranking in the top-10 (most of that in the top-5), an SEC Championship, a possibility at a second national title. I'd say that's pretty successful. So don't pay attention to jerks like me, boys. Go get 'em one more round. Roll Tide. "styles make fights" in boxing actually means that one fighter may dominate another fighter, but another fighter who is just as good as the dominant fighter may lose to the first opponent that was dominated by the other.. which means that the style of the lesser fighter is difficult for one fighter but easier for another .. for ex. he may be a Southpaw (left-handed), fighting from the left side creates difficulty for one fighter but not for another .. that is what is meant by "styles makes fights" in boxing .. has nothing to do with whether it's entertaining or not, because it usually is, because the audience doesn't know what to expect ..